Political intrigue and religious persecution in fifteenth century Spain. Synopsis: Luis de Santangel, chancellor to the court and longtime friend of the lusty King Ferdinand, has had enough of the Spanish Inquisition. As Inquisitor General Tomas de Torquemada's power and influence over Queen Isabel grow, so does the brutality of the Spanish church and the paranoia it inspires. When a dear friend's demise brings the violence close to home, Santangel takes retribution into his own hands, though the risk is great. Santangel is from a family of conversos, and his Jewish heritage makes him a target. As Santángel witnesses the horrific persecution of his loved ones, he begins slowly to reconnect with the Jewish faith his family left behind. Feeding his curiosity about his past is his growing love for Judith Migdal, a clever and beautiful Jewish woman navigating the mounting tensions in Granada. A superb debut novel that contained everything I always hope to find in historical fiction. Historical accuracy, a strong background with lots of lovely descriptive prose, well-developed and realistic fictional characters........and this book has the bonus of also giving a different perspective of some well known real persons. There are several different threads within the story all related to the theme of expansion, exploration and aquisition and drawn together by Luis de Santagel's involvement with them. As Chancellor and confidante to Ferdinand and Isabel he is privy to their plans to reconquer Granada , and knows of their desire to purify Spain by expelling or converting Muslims and Jews ..... and topping up their coffers with the confiscated wealth. He is the man who Christopher Colombus must turn to for help in obtaining the necessary funds from the Crown to finance his voyage to the new World. The presence of Judith not only provides a romantic interest but a glimpse into the lives of the Jewish people in Granada , their plight as the Christian army defeats the Muslims and the frightening realisation that if they aren't prepared to convert , they must leave . I thought the love story was beautiful - it's presence was like a pastel thread in a tapestry of bright colours which somehow made it all the more poignant. But it was the approach to the Inquisition that made this book special for me. I've read many books of this time, skipping through pages with a churning stomach, trying to avoid the too graphic descriptions of torture and burnings. By Fire, By Water is less focused on what the Inquisition did and more on revealing the reasons and motivations of those responsible and the effects it had on the lives of those living in it's shadow. So it was Luis de Santangel's personal journey of spiritual discovery that interested me the most. ".....he explored ideas that had intrigued him all his life. He argued about the nature of truth, God's role in history, justice, love. He came to feel an intellectual enfranchisement he had never felt before, invigorating and empowering. The freedom to navigate between the great ideas and sentiments of his own faith and that of his grandfather was a rare privilege." Not acceptable to a Church that maintained it's power by ruling through fear and expected nothing less than total acceptance and blind obedience to it's rules. Obviously well-researched, a beautifully written, powerful and moving story.....I loved it! And I'm very happy that I don't have to return it to the library. Many thanks to Mitchell Kaplan for sending me a copy to review..........his website is here. 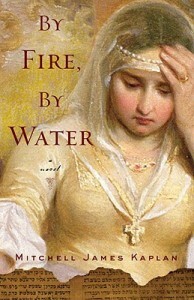 Has definitely earned a place on my 10 Best Historical Fiction list. Wow Cat, I knew that I wanted to read this book, and the more reviews I read, the more I become intrigued. Your review has totally left me with no doubt....this book is a must read for me!!! The time-period, and subject matter greatly interests me, and the fact that you think Kaplan's writing is beautiful, powerful and moving has me pumped. Thanks. This isn't a part of history that I know much about. I keep hearing good things about this book - I'll have to give it a try. Everyone loves the book, I really must read it, have I even seen a neg one, must google! I recommend - I'm sure you'll love it. Wow ... that is some high praise. Glad you found a book that suits you so well. Another fantastic review for this one, I'm so looking forward to reading it. I have this one waiting for me - good review! This is indeed a wonderfully-written book! I will be posting my own review this week and I couldn't agree more with you. One for the 'keeper shelf'.